Now, what are real potato chips? Not the French fries, which are actually Belgian fries. And not the poor imitations you wolf down with untold amounts of salt and preservatives! 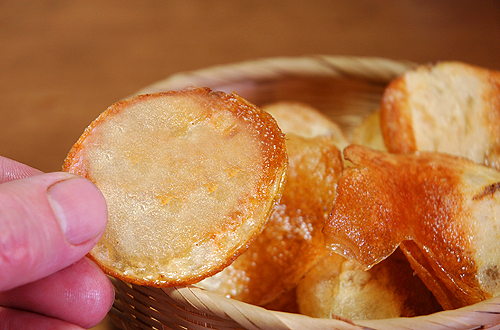 Real potato chips, as known in Great Britain or France (!) are made with potatoes, real ones I mean, and they are easy to make and much, much healthier! Now, what do you need? Potatoes, of course, a (very) little salt and good oil. Your potatoes, being old or not, can be used with a simple technique. If they are old, no problem. If you brush them (with a real hard brush) under clear water, you will be able to reduce their outer layer to a very thin skin that is edible (actually most of the really beneficient matters are contained in their skin!). Cut them as thin as possible (with their skin!). Important: slices of different thickness should not be fried together. Try to separate them as shown on above pic and fry them separately. Great fun if you have the kids around! Clean potato slices in cold running water. This is an important step unless you want them to stick together, turn black and make a mess! Dry them thoroughly inside a large clean cloth (or the water will fly upon frying!). Heat frying oil to 170 degrees Celsius. This is how your chips should look just before frying! Use long wooden chopsticks to prevent chips from sticking to each other. Your chips will change colour and if the oil is at proper temperature swell nicely! Once you are satisfied with their colour, take them out of the oil and let them rest for a very short while over a fine mesh to get rid of excess oil. Sprinkle a (very) little salt for taste. I personally like some parmegiano and pepper instead of the salt! Don’t forget the “wrong shapes”! They make for great chips, too, especially with the kids! I susally serve the round chips with oven-baked chicken or guinea fowl! Did I mention vegans can eat these?